Wow, I’ve read all of Horton’s 2012 volume in 2012, a big improvement over previous years. Here we go, with reviews of stories previously read in their original appearance inserted, alongside stories read in this volume. If you haz not got the volume, here as some links : amazon.co.uk | amazon.com. You could of course buy the book from a shop (you know, bricks and mortar and pay taxes). Originally in : Clarkesworld #52, January 2011. 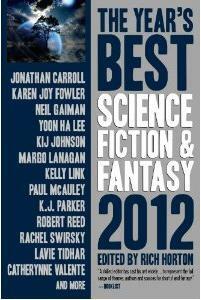 After a very successful 2010, this is Clarkesworld Magazine’s ‘first story for 2011 and it is online here. It’s a lovingly crafted story, an intriguing contrast with the action of the story – full-blooded mayhem on a large, if impersonal scale. The plot summary does no justice : a young soldier flees her ravaged homeworld on an alien war vessel, wreaking revenge on a colossal scale, until she in confronted by what she has become. What marks the story out is the subtle crafting of the main character, the intriguing ‘ghost’ that accompanies her, the backstory and the politics, and the effort that Yoon Ha Lee has put in throughout – the alien vessel’s control room comes across as alien, with tapestries and control systems quite unique. It’s an excellent story of shadows, origami folding weapons and vessels, smoke and hidden and unknown identities, desires but also duties. Bit too fantasy for me, so I’ll skip this one. Bradley Denton. The Adakian Eagle. Vylar Kaftan. The Sighted Watchmaker. Alan DeNiro. Walking Stick Fires. A buddy story, the buds in question being aliens, but still most excellent and savoury. Their gnarly adventures are set on (and under) and Earth that is under terrible onslaught from a wide range of alien species, both small and very, very large. Totally non-bogus. The fact that my two most excellent sons are named Bill and Ted bears no relevance to my liking of the story. Suzy McKee Charnas. Late Bloomer. Originally in : Asimovs, February 2011. Jonathan Carroll. East of Furious. Short alchaemic fantasy/horror featuring a divorce lawyer and a client with more than a touch of the Midas about her. Originally in a YA anthology, this is an effective story of love and loss on Mars, with a clever background of the challenges, and risks, involved in getting to Mars. The narrative is in the shape of a reflective interview by a succesful Martian. You know it’s not going to have a happy ending from the outset, but it still has an impact at the end – especially if you’re a sentimental old sod! – and would be a good introduction to the genre to a person of restricted age. Originally in : Asimovs, July 2011. A gentle story of a sickly child in the 19th century, from a well to do family. Her quiet life is made more bearable by a secret doorway, which takes her to other times and other places – but not too far – through which she is able to lead a more fulfilled life. A touch of Tom’s Midnight Garden, with a pinch of the Brontes/Austens. Duncan has had a series of well-wrought stories in F&SF of late, and this is no exception. It’s a historical tale, set in the medieval Mediterranean, and has a heroic, perhaps doomed quest, set against a complex society, with politics and religion playing strong roles. The only thing missing is a fantastical element – the opportunity is there, as alchemy plays a part, but Duncan avoids any magical element, to keep the story as mainstream historical fiction. Neil Gaiman. And Weep Like Alexander. Originally in : Fables from the Fountain (ed Ian Whates). Part of an anthology published in homage to the Arthur C. Clarke ‘Tales from the White Hart’ milieu. In this story, a visitor to The Fountain public house relates just how he has had an impact on the world around us. Just a couple pages, and a single conceit, but nicely told. To say more here would be the ultimate spoiler of that central conceit. I was very much minded of Charles Stross’ Manfred Macx/Accelerando with this story, a near(ish) future story that looks a few technological steps ahead, considers some ecological and political developments, and put them into a story that benefits from a slow reading to savour the detail. As you see (it is online and the link is above) the opening paragraph successfully captures the attention : “The Granny wasn’t talking to any of them. The husband was collecting rocks, the other wives had stayed with the house, her mother was stretching at the other end of the beach, and the kids were running wild in the waves. The baby, still in utero, had only recently begun talking to her and already knew when to keep quiet.” It makes you re-read it just to make sure you fully understood the cast of characters being introduced and their relationships. Suffice to say, there is a mobile house (and I mean mobile!) with it’s own AI, the intelligent communicating pre-natal child, politics in the Hague, Somali pirates, fearsome haggises (hagii) and a complicated set of family relationships,, and more. And it’s well worth the read. Karen Joy Fowler. Younger Women. Personally, I’d give short shrift to any story that was in the contemporary suburban teenage vampire milieu. A beautiful little SF love story. Strong SF setting, and gorgeously written by Lawson with a deft touch that stops the story slipping into mawkishness. Kelly Link. The Summer People. A cracking little story, whose only drawback for me was the WTF moment when I turned a page to find there was only a half page left. I’m all for leaving the reader to make use of their own imagination, but it was so frustrating not to know the detail. The story is set in a contemporary rural community, where a teen girl is struggling with a very, very nasty virus, and her alcoholic father leaves her to seek redemption at a religious meeting a long way away. Earning money by looking after and prepping the summer houses of the wealthy city-types, the girl has another house nearby which she helps out now and then, and which, through its strange inhabitants, help her out. Not truly steampunk, more fantasy. I’ve a fondness for Lanagan’s stories, as they tend to a darkness and an exploration of the underbelly of fantasy/sf that other’s tend to leave alone. And she doesn’t disappoint here. In a remote forest, the families in a small village have been making money from silk – but the source of that silk…. We follow a young man from the village as he sees exactly what happens as part of this process, treated with virtual contempt by the well-dress city-dweller whom he has been tasked to help find a Mulberry Boy. It’s like The Hobbit/LoTR should be, none of that Tom Bombadil nonny-nonny queen of the elf stuff! Nina Allen. The Silver Wind. A near-future dystopian London is the setting for the story (I’m working on the basis that you aren’t a neo-fascist racist xenophobe brownshirt and therefore it is dystopian rather than utopian). Whilst Shooter’s Hill has been returned to the dense woodland of its past, in it lurks a dark secret. Kat Howard. Choose Your Own Adventure. 1. A short selection of options investigating the multi-choice adventure. If you think this is a Year’s Best quality goto 2, otherwise go to 1. K.J. Parker. A Small Price to Pay for Birdsong. A lengthy story that had me engrossed to the point of almost missing my stop on the train! The central character is a complex one, and the story is long enough to get into his head – an academic and composer, someone who just does not have the little something extra to be brilliant. Unlike his pupil, who has brilliance in spades, but that brilliance comes too easily. Following the academic’s thought processes as a wonderful, but risky opportunity is presented to him, keeps you hooked right up to the end. Having read the story a couple of days ago, mind you, I’m struggling to remember any truly fantastical element to it! Robert Reed. Woman Leaves Room. Excellent short story (read it now!). Touching on the territory of David Marusek, we follow (as we quickly guess) a virtual construct and end up with a love story. George Saunders. My Chivalric Fiasco. Originally in : Harper’s Magazine (available online to their members, in PDF and the exciting new format : microfiche). Witty short, through the eyes of a janitor in a medieval theme park who gets His Bigge Chance, but for whome Certaine Substances cause an outbreak of moral rectitude that proves to be A Bad Thing. C.S.E. Cooney. The Last Sophia. An unsettling fantasy (read it at the link above!) told through the disoriented perspective of a young woman who has given birth to several changelings, fathered by the strange incomers. Marissa Lingen. Some of Them Closer. Rachel Swirsky. Fields of Gold. A beautiful story from Swirsky, a classy storyteller. At first sight the setting (an afterlife in which everyone is reunited, with the likes of Napoleon, Marilyn Monroe and Ghandhi making appearances) could be offputting, but this central conceit is used to explore some complicated, flawed characters, notably the newly deceased protagonist, Dennis, a surprise guest at his own post-death party. We find out about his unfulfilled dreams (neatly listed), his marriage, and his first love (! ), and just when you think the story is going to end with a bitter, ulcerated eternity for Dennis, his future opens up (by going back) into a poetic ending. Lavie Tidhar. The Smell of Orange Groves. Having just finished reading Tidhar’s Strigo in Interzone #242 Sept/Oct 2012(reviewed here), which followed on from ‘The Indignity of Rain’ from Interzone #240 (reviewed here), both good reads, I realised I had this story to read in the latest Dozois and promptly read it. This story is, like the two Interzone stories, part of Tidhar’s ‘Central Station’ sequence, and indeed, ‘The Smell of Orange Groves’ finishes with a meeting which is subsequently replayed, but from the other protagonist’s perspective, in ‘The Indignity of Rain’. As a standalone story though, this story if fine enough, looking at Boris Weiei, and how the memories of his grandfather are echoing down the generations. The society that is painted in Tel Aviv/Jaffa, the various religions, the daily lives, and above all the sensual believability of the city give the story a richness. Excellent stuff. Have a read of the story in Clarkesworld, then get yourself copies of Interzone – either the sleek, new smaller format magazine, or an e-version, and read the subsequent stories. I’ve tried reading this, and tried listening to the podcast and it hasn’t grabbed me in either case. Click the link above to read it yourself. Originally in : Asimovs, October 2011.